Inspired by 2,000 years of storytelling yet rooted in the concerns of our present moment, this is a spectacular achievement -- enchanting, both very funny and terrifying. It is narrated by our descendants 1000 years hence, looking back on "The War of the Worlds" that began with "the time of the strangenesses": a simple gardener begins to levitate; a baby is born with the unnerving ability to detect corruption in people; the ghosts of two long-dead philosophers begin arguing once more; and storms pummel New York so hard that a crack appears in the universe, letting in the destructive jinns of myth (as well as some graphic superheroes). Nothing less than the survival of our world is at stake. Only one, a djinn princess who centuries before had learned to love humankind, resolves to help us: in the face of dynastic intrigue, she raises an army composed of her semi-magical great-great--etc.--grandchildren--a motley crew of endearing characters who come together to save the world in a battle waged for 1,001 nights -- or, to be precise, two years, eight months and twenty-eight nights. I honestly don't even know where to start, but here goes nothing. There are two worlds - ours and the magical world the jinn live in. One day a crack forms between the two worlds and the jinn, both good and bad, slip through to our world. The jinn can do many, many things... influence people to do just about anything, curse them for eternity, give them a magical gift... they're magical creatures so... yeah. We follow a few humans and get to witness the weird things that start happening to them, to people around them, and to the world around them. This is when "the time of the strangenesses" begin, which last for the amount of time the title of this novel suggests. Before the crack was opened, a good jinn princess slipped into the human world and lived for many years. Almost all jinn are incapable of human emotions such as love, jealously, gratefulness, shame... and the princess wanted to experience those. She married a philosopher and had many children. Her children all had one thing in common - they had no earlobes. Weird, but not too weird, right? Eventually the philosopher chooses work over his wife and moves away, leaving her and their children. With this, the jinn princess goes back to her world. Now years later, this crack between the two worlds is causing chaos and fear. Remember the jinn's children? Think about how they had children, then more children, and so on until there are now countless half human/half jinn people in the world. When that crack was opened, many things start to plague these earlobe-less people and you can't help but be sucked into their lives. 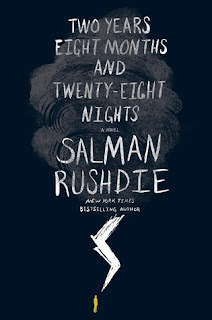 Rushdie presents yet another stunning literary novel full of fantasy, stories I have no how how he came up with, and a writing style that always keep me interested. I have never read Rushdie. But now I will. This book was already on my TBR, and now I wanted to read it even more! I tried to get my hands on an ARC of this a little while back and did not succeed!! It looks so good! Can't wait to read it!